A Very Young Composer Gets His Chance At The N.Y. Phil : Deceptive Cadence Through the Very Young Composers program, one fifth-grader gets his music played by one of the world's top orchestras. The central idea of the program is to tap into the kids' creative spirit without getting in the way. Very Young Composer Milo Poniewozik joins assistant conductor Joshua Weilerstein at the head of the New York Philharmonic. As part of the orchestra's School Day Concerts, Milo's piece was performed in front of more than 2,000 kids. What would it be like if you were 10 years old and composed a piece of music that was played by the New York Philharmonic? For a few New York City school kids, including one fifth-grader, it's a dream come true, thanks to the orchestra's Very Young Composers program. Composer Jon Deak, who played bass with the New York Philharmonic for more than 40 years, says the idea for Very Young Composers came when he and conductor Marin Alsop visited an elementary school in Brooklyn several years ago. "As we were going in, I saw all the children's art on the walls, which was so superior," Deak says. "I said, 'That's it, Marin! We've got to get kids to compose music on the level of this art right here, because look: Doesn't that look like a Picasso? Doesn't that look like a Paul Klee?'" 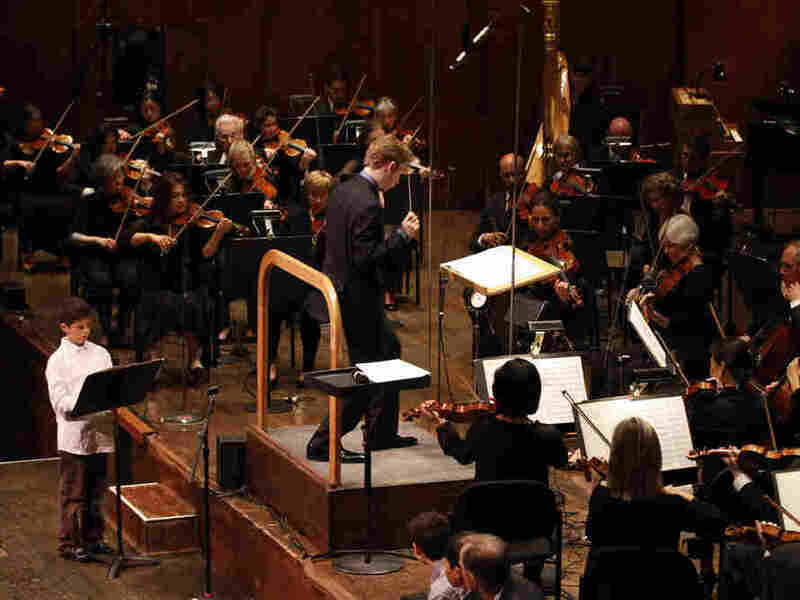 So Deak set about getting the musical equivalents of paints, paintbrushes and canvas for children in elementary schools that partner with the New York Philharmonic. Each year, 72 lucky kids in six New York area schools participate in this free after-school program. Theodore Wiprud is the Philharmonic's director of education and also a composer himself. "The kids are not chosen for being musical geniuses," Wiprud says. "The guidelines we give the schools, in trying to identify some fourth- and fifth-graders for the program, is that they be kids for whom this could make a difference. Whether or not they study an instrument is not necessarily a good predictor of whether they're going to do something creative in music." On a Tuesday afternoon in January, 12 kids have gathered in music teacher Paul Trust's classroom at P.S. 39 in Park Slope, Brooklyn, to start their musical journey. Teaching artist and composer Daniel Felsenfeld begins by getting them in sync with the rhythms he's clapping. Over the next 12 weeks, each of these kids will learn some of the rudimentary elements of composition — a little bit about musical notation and a little bit about the instruments of the orchestra — through classroom demonstrations. Cellist Rose Bellini demonstrates all kinds of cool effects she can do on her instrument. Deak says the central idea of the Very Young Composers program is to tap into the kids' creative spirit without getting in the way. "Some of these kids have trouble locating middle C on a piano," Deak says. "Does that mean they can't compose music of depth? No. What do they have to do? They have to hum it for us, sing, whistle, tap the rhythms — even if they can't notate them — and we get their piece." As Felsenfeld puts it, "The most important thing about this class is that you never, ever, ever write their music for them — not even a little." One of the children at P.S. 39 is already a vet. Milo Poniewozik is a 10-year-old fifth-grader. Last year, he wrote a quintet that was played by musicians from the Philharmonic. This year, he expanded his piece so it can be played by the whole Philharmonic. "It's orchestrated for the entire orchestra, meaning not just the double bass, violin, flute, all that, but also the harps, the horn, the trumpet, more woodwinds, stuff like that," Milo says. He and Daniel Felsenfeld have gotten together and worked with a musical notation program called Sibelius, which allows Milo to listen to a digital approximation of the orchestra. "I also had to make a lot of decisions because with only five instruments, you don't really need to think about how big or how quiet you want the music to sound, because it's really not a lot of instruments," Milo says. "But with the orchestra, you can make it sound like everything — or nothing." On a Wednesday morning in late May, Milo and Daniel arrive at Avery Fisher Hall, where the New York Philharmonic has gathered to rehearse pieces by nine of the Very Young Composers. Before he knows it, Milo is standing in front of 100 musicians and Philharmonic assistant conductor Joshua Weilerstein, hearing his work played by an orchestra. "I thought it was really cool, being able to hear the orchestra play my piece for the first time," Milo says. "It was definitely a lot different than hearing it on the computer." Deak calls Milo's work "a knockout little piece." He continues, "I just gave a whoop when I saw it because it shows both a child's spirit and yet some grasp of adult issues in a way you just can't predict." The next day, with more than 2,000 New York City schoolkids in Avery Fisher Hall, Milo introduces his piece, The Globetrotter, in an interview with Wiprud. Afterward, Milo is a little bit breathless. "It was really cool to be able to stand up in front of the entire audience and have my piece performed," the young composer says. "I was a little nervous, at first, that something was gonna go wrong; like, you're afraid that you're gonna fall off the stage or your shoes are gonna slip off or something. You know, you're just afraid you're gonna make a mistake." But he quickly adds, "It sounded really good. It was how I wanted it to sound." And Milo says he's definitely going to continue to compose music. Listen to 10-year-old Milo Poniewozik's original composition, as performed by the NY Philharmonic.